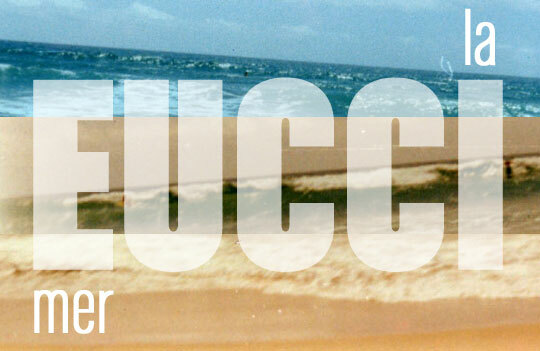 Rive028: Eucci "La Mer / Storm Summer Girls"
Eucci's tiny sounds take us to the beach - three beaches in fact - and then into the mountains for three variations on a summer storm. Rain, sun, piers, lakes, joy, sea, nostalgia, and longing sink and sing beneath the currents. Tracks 1,2,3, produced by Eucci at Merediths, spring 2003. Tracks 4, 5, 6 produced by Eucci 2002-2003, based on "Rainstorm" by Summerhead (Holmes, Svedin) courtesy of Eden's Watchtower Records. Remastered January 2011 by Eucci at Sunhil. Rive 028; © 2002-2003 Eucci; ℗ 2003 Eucci; ℗ 2011 Eucci, Rive.